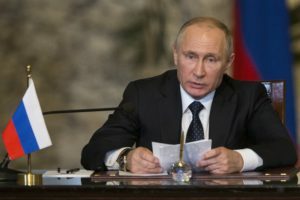 MOSCOW — Russian President Vladimir Putin on Thursday scoffed at allegations of collusion between U.S. President Donald Trump’s campaign and Russia, saying they have been “invented” by Trump’s foes and have hurt the U.S. political system. He noted that Russia is particularly worried about what he described as U.S. violations of the INF Treaty, a Cold-War era pact banning intermediate range missiles. The U.S. has accused Russia of pact violations — charges that Russia has denied. Putin said the U.S. accusations are part of a “propaganda” campaign to pave the way for the U.S. withdrawal. Rodchenkov’s testimony played a key role in International Olympic Committee investigations that led last week to Russian athletes being required to compete under a neutral flag at the 2018 Winter Olympics in Pyeongchang. Nataliya Vasilyeva and James Ellingworth in Moscow contributed to this report.